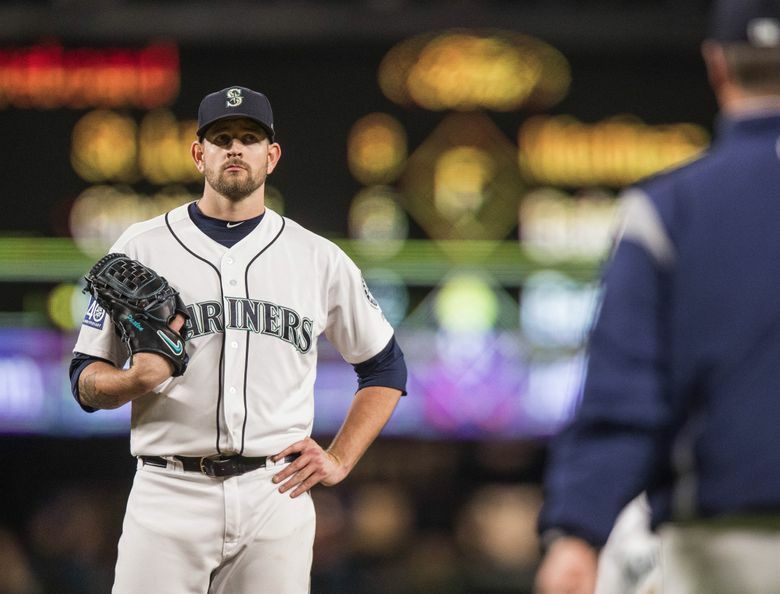 James Paxton watches as manager Scott Servais comes out to the mound to pull him after 73 pitches Thursday. The Texas Rangers played the Seattle Mariners Thursday, September 21, 2017 at Safeco Field in Seattle. Despite the wishes of some fans, Mariners' general manager Jerry Dipoto feels comfortable with his projected rotation going into 2018. So in just a handful of days — Valentine’s Day to be exact — the Mariners’ pitchers and catchers who have been invited to big league spring training will report to the team’s complex in Peoria for their physicals. Their first workout will be the following day. And in that time between now and report day and maybe the days following, there will still be some Mariners fans holding out hope that general manager Jerry Dipoto, the man of a million transactions, will stun them with the signing of a free agent starting pitcher to supplement a rotation that many outside of the organization feel is somewhat lacking in talent, depth and reliability. There are pitchers out there. The top four free agent starting pitchers — right-handers Yu Darvish, Jake Arrieta, Alex Cobb and Lance Lynn — are still waiting to be signed, as well as a slew of others for what could be a reduced price. But based on everything Dipoto has said in the last month, it doesn’t appear that will happen. Because for as much as he’s been asked about the starting rotation, the more steadfast he’s gotten in his defense of the projected five-man staff and his willingness to go into the 2018 season without adding more. Both Dipoto and CEO John Stanton have shrugged off the premise that this belief has something to do with payroll budget limitations. That doesn’t sound like a man motivated to add more. Of course in the movie, Jimmy rejoins the team and they go on to win it all with him making the final shot. It doesn’t seem as though one of those four free agent starting pitchers — or any others for that matter — will be joining the Mariners. And winning it all? Well, the Mariners might have to settle for hoping to notch the second wild card spot, which is far from a given. The first four spots are set with Paxton, Hernandez, Leake and Ramirez on guaranteed contracts. Gonzales will make the opening day roster in some form because he’s out of minor league options. He could also be used out of the bullpen as a long reliever if needed, but the Mariners won’t expose him to a possible waivers claim after giving up outfield prospect Tyler O’Neill to get him last season. “Marco will be given every opportunity to make our club,” Dipoto said. If for some reason they decided to not use him in the rotation, Seattle would turn to lefty Ariel Miranda, who made 29 starts and two relief appearances, posting an 8-7 record and 5.12 ERA last season, or right-hander Andrew Moore, who went 1-5 with a 5.34 ERA in nine starts and two relief appearances. But because both have minor league options available, they seem slotted for Class AAA Tacoma’s rotation. The Mariners believe that Gonzales will be different pitcher than fans saw at the end of last season because he’s now in his second year following Tommy John surgery. “Common sense tells us or medical history tells us that the second year is the year that you start to see the command back to what it was before,” Dipoto said. “We’ve already seen multiple innings of Marco. The change-up is every bit as effective as it ever was, and it’s been his best pitch since high school. Meanwhile, the other four starters aren’t without question marks or concerns — be it health or performance. A year ago, Seattle had 17 different pitchers make a start because of either injury or poor performance from its rotation. It’s impossible to think that the projected five will make every start. That just doesn’t happen. It means Miranda, Moore, Max Povse and possibly Hisashi Iwakuma, who signed a minor league deal and won’t be ready until May because of shoulder surgery, could make starts as well. Manager Scott Servais said they will employ a sixth starter at times to give extra rest to Paxton, Hernandez and Leake. So what is logical to expect? Of the rotation, Paxton is obviously poised for greatness … if he can stay on the field. Last season, he was unquestionably the Mariners best pitcher and at times one of the most dominant in baseball. Paxton posted a 12-5 record with a 2.98 ERA in 24 starts despite two stints on the disabled list with a forearm strain and later a pectoral strain. He has vowed to remain healthy in 2018. His goal is to make the 30-plus starts of a staff ace. If that happens, the Mariners could have a true No. 1 starter-level production for the first time since Hernandez dominated in 2014. Speaking of Hernandez, the longtime ace has been hit hard by injury, physical regression and mechanical inconsistency the last two seasons, with some hints of the coming problems dating back to 2015. Dipoto put a large onus of the team’s success on Hernandez staying healthy this season. It would seem a logical answer would not be relying on something as unpredictable as Hernandez’s health and production and hedge it with an established pitcher to pitch in between him and Paxton. But that doesn’t seem to be happening. Leake is a solid veteran who will make his starts and be effective most of the time. Ramirez can be steady and at times solid, but not dominating. He also has shown the ability to pitch out of the bullpen in long relief. Dipoto considers the trades of Leake and Ramirez at the end of last season as pre-offseason moves for 2018. So it probably won’t be with the Mariners.